Vistarenni was known in early times as Fisterinne, which might derive from an Etruscan word meaning "good view". Fisterinne was a castle or a village, one of the rural settlements that, in Roman-Etruscan times, were dotted throughout the territory surrounding the Etruscan centre of Cetamura. It was first documented in the year 1033 in a manuscript from the nearby Badia a Coltibuono. This deed was drawn up at the Castello di Montegrossi and established the borders with San Donato in Perano. In the 15 C, Fisterinne was a village composed of six or seven houses and owned by the Cecchini family from Panzano. 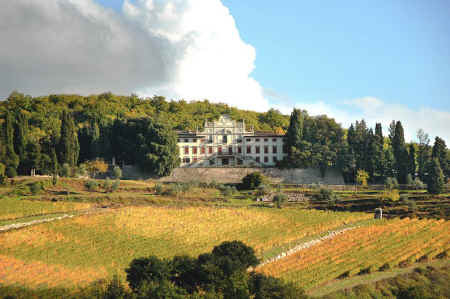 In 1621, it passed to the Florentine Giannozzo da Cepparello and in 1714 to the Pianigiani family, from Radda in Chianti. That was the end of the ancient borgo of Vistarenni. During this period, Vistarenni was transformed into a Renaissance villa-farm with a courtyard, kitchen garden, olive oil mill and cellar. In 1852, Vistarenni was bought by Prince Ferdinando Strozzi (1821-1878), a member of the famous Florentine Strozzi family. Prince Strozzi was part of the Tuscan Assembly in 1859 and a Senator of the Kingdom of Italy from 1860. Vistarenni was managed for about 40 years by the Strozzi whose coat-of-arms can still be seen in many rooms of the villa. The estate consisted of 26 holdings located in the municipalities of Radda and Gaiole, each holding with a farmhouse, a yard or threshing floor and a shed, and was managed under the traditional mezzadria (share cropping) system. In 1892, Vistarenni was purchased by Baron Giorgio Sonnino, brother of Sidney Sonnino, who twice served briefly as Prime Minister of Italy, in 1906 and again from 1909-1910, and was the Italian Minister of Foreign Affairs during the First World War, representing his country at the 1919 Paris Peace Conference. Giorgio Sonnino was a science graduate from the university of Pisa, who lived in San Miniato di Firenze, near San Miniato al Monte, and was elected Senator of the Kingdom in 1868. The books and documents in the villa's library are evidence of his vast range of interests, from agriculture to public finance, from merchant shipping to African affairs and especially the colony of Eritrea. 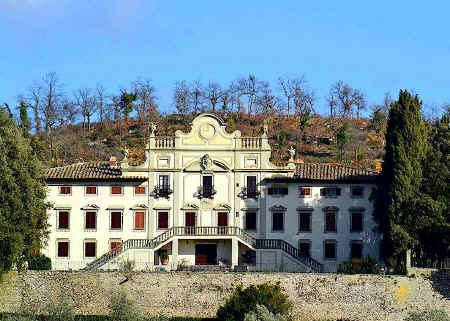 The Vistarenni estate was enlarged from that moment on until it covered an overall area of 650 hectares. The average annual production of Chianti wine was at that time over 2300 hectolitres. Baron Sonnino had the façade of the villa embellished and between 1914 and 1919 the four pilaster strips of the central body, the lintels (arched and flat) over the windows of the piano nobile and the large, two flight staircase were added by the Florentine architect Ludovico Fortini. The large and distinctive clock embedded in the façade dates from this period. A small, 16 C chapel in Neo-Renaissance style is dated 1584 on the lintel. It was used as the Sonnino family vault and was dedicated to the Florentine St. Maria Magdalena de'Pazzi (1566-1607), one of the most prominent ecstatic saints of the Catholic faith. Vistarenni now belongs to the Tognana family. Click here for your vacation in Chianti: Tuscan villa rental, agriturismo, Tuscan farm house with pool to rent rural and village Bed & Breakfast room.